"I was up early this morning having my prayer time and Bible reading when I heard the news of Dr. Graham's passing. The first thing I did was to thank God for sending Billy Graham into this world. My youngest daughter Molly gave her life to Jesus watching him on TV during one of his Crusades. It's a story of millions of people just like Molly that came to Christ listening to Dr. Graham's simple message of God's love and forgiveness. 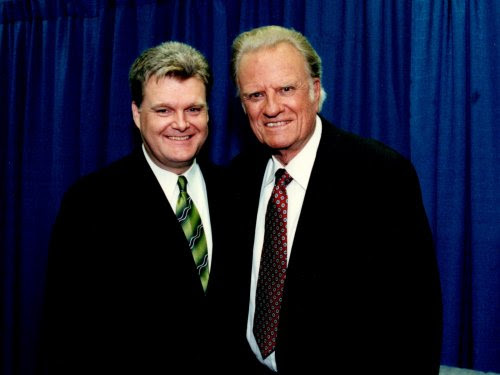 There has never been an evangelist in our lifetime that has had the Christian integrity in ministry that Dr. Graham had. It was because he lived his life intentionally to honor Christ. He had righteous Godly men around him all the time, praying for him and praying with him everyday. He set up safeguards for his life as a husband, a father, and his life as a minister of the gospel. His ministry reflected his personal life and his personal life reflected his ministry. What a concept! He was above reproach, and he lived there always, because he never wanted to give anyone the slightest hint of doubt that he wasn't who he said he was. His desire, first and foremost, was to honor the Lord Jesus Christ with his whole heart. He knew who he was and he knew Whose he was. He knew he was a beloved son, yet calling himself a sinner. Hard to imagine, but humility will do that to you. He believed the words of John the Baptist, when John said of Jesus, 'He must increase and I must decrease,' great words to live by. I'm so thankful that I got know Dr. Graham and do some of his Crusades. The first one I did was in Columbus, Ohio at a baseball field. I was up on stage singing some songs and it was pouring down the rain, big sheets of rain. I thought, all these people will go home, no one could sit through this storm, but no one left, some had umbrellas but most of them didn't. Then all of a sudden, I looked and they were bringing Dr. Graham toward the stage in a covered golf cart, it stopped raining, it completely stopped. I knew then the favor of the Lord was on this man. I'm so grateful for the friendships I've made with the Graham family. Franklin is one of my dearest friends. I'm thankful that they allowed me and my family to come visit Dr. Graham and sing some songs, eat a hot dog, and pray with him at his home in Montreat, NC. The scripture says 'a man's gift makes way for him, and brings him before great and mighty men.' From President Truman to President Trump, 13 Presidents, Queen Elizabeth and countless other leaders of many nations, Dr. Graham's message has never changed. 'For God so loved the world that he gave his only begotten Son, that whosoever shall believe in Him shall never perish but shall have everlasting life.' Dr. Graham did not die, he just changed his address!" I was able to be with and perform for Billy Graham during his Farewell Crusade in NYC, thanks to Jim & Carol Cymbala of the Brooklyn Tabernacle and their choir. If the Bible was still being written, I feel like that moment would have been in it - thousands came to know Christ that day. It was one of the greatest moments I've ever had the opportunity to be a part of. The impact and legacy of Billy Graham is immeasurable. There is perhaps no person who conveyed the love, grace and saving power of Jesus Christ so eloquently as Mr. Graham. You know a lot about a person by the life they live but you know more about them by the way their family loves them. I am friends with his grandson Will, and he is one of the most kindhearted people I know. Every time we talk, he talks about how much he loves his grandfather and how much he has shaped the man he is today. I love this family so very much. I just performed at Billy Graham Training Center's The Cove on Sunday night and Will shared a story about a new film that is coming out and the thing he was so excited about was that he was playing his grandfather in the film. Will 2018 Be Dottie West’s Hall of Fame Year? Strong-willed and charismatic Dottie West was one of the female artists who blazed a new trail for women in country music, helping to shape the way women were, and continue to be, perceived in the industry. Her legacy among the first trendsetting women in country music is unquestioned, and her work stands on its own merit. So why then, over 26 years after her untimely death, is Dottie West not honored in the Country Music Hall of Fame? That question was prevalent at the “Dottie West Birthday Jam” which was held this past October at the Third & Lindsley music venue in Nashville. Dottie had a sharp, keen eye for talent. She was instrumental in the careers of fellow Grand Ole Opry members Jeannie Seely, Larry Gatlin, and Steve Wariner. Others performing at the Dottie West Birthday Jam included David Frizzell, Jimmy and Michele Capps, John Schneider, Tony Toliver, Dottie’s daughter Shelly West, her sons Kerry and Dale West, and her granddaughter Tess Frizzell. Dottie was known for her heart-of-gold manner, and for feeding lonely or needy artists and songwriters her home-cooked meals. In her 2005 memoir Looking Back To See, Hall of Fame member Maxine Brown wrote: “Dottie was the only one who ever invited me and my children to her home for Sunday dinners. I’ve always been grateful for her kindness to my children and me.” Maxine, the only surviving member of The Browns, is among the many who have joined Steve, Jeannie, and Larry in support of Dottie’s Hall of Fame induction. Also included on that list of supporters is the name of Kenny Rogers. In a 1978 press release for their duet album Every Time Two Fools Collide, Kenny credited Dottie with further establishing and cementing his career with country music audiences. Fast forward 36 years to the opening of the Kenny Rogers exhibit at the Country Music Hall of Fame and Museum. Kenny addressed the crowd that evening by emphatically stating: "But mostly I want to go on the record right now saying, we need to get Dottie West in here. That girl deserves this, and if there's anything I can do, I'm gonna do it." Dottie recorded duets with not only Kenny, but also with Jim Reeves, Don Gibson, and Jimmy Dean – and like Kenny, they all have plaques hanging in the Hall of Fame today. Dorothy Marie Marsh grew up as a poor farm girl in little McMinnville, Tennessee. She had the guts and drive to become a music major at Tennessee Tech, then later began her quest in search of singing fame by landing a job at the Cleveland, Ohio, country TV show Landmark Jamboree. During that time she would get to work with Opry singers and Nashville talent who would make guest appearances on the show. Dottie would later cite female stars of the day and future Hall of Famers Mother Maybelle Carter, Patsy Cline, Minnie Pearl, and Brenda Lee (another present-day supporter for Dottie’s Hall of Fame induction) as important teachers during that period of her life. Dottie began writing songs in 1961, and her songwriting effort “Is This Me?” became a Top 5 hit for Jim Reeves. That led to a recording contract on RCA for Dottie and the beginning of her own hit-making career. They called them “girl singers” when Dottie began her career in country music, and there weren’t many of them around. Women had an uphill fight, and Dottie was right there in the trenches. She became a pioneer in establishing females as both songwriters and solo vocalists, and she helped change the status from mere “pretty little girl” stage decoration to female headliner. Dottie stepped into the solo limelight with her self-composed single “Here Comes My Baby,” which garnered her the first Grammy Award ever presented to a female country artist and led her way to membership in the Grand Ole Opry. What many don’t realize is that Dottie’s subsequent recordings earned her 15 additional Grammy nominations. That’s more nominations than even Elvis received. Dottie’s motivation, determination, and frankness allowed her to break barriers for women in country music. “I don’t speak for others, though, I speak for me. I tell it like it is,” she once said. But in speaking for herself, she spoke for her generation of women. In a 1985 interview, Dottie said, “Finally, they know that we can sell tickets to concerts and we can sell records.” And she did both. Dottie performed on stages everywhere from clubs, festivals, and county fairs, to casinos, cruise ships, arenas, and stadiums. Along the way she placed 63 records on Billboard’s country singles chart, including five No. 1 hits. She also charted 23 country albums as well. Dottie appeared in stage productions, in motion pictures, and on television shows like Solid Gold, Midnight Special, The Love Boat, The Fall Guy, The Dukes of Hazzard, The Hollywood Squares, Hee Haw, American Music Awards, and many others. She rode on her own float in the Macy’s Thanksgiving Day Parade, she was the ringmaster on a Circus of the Stars special, and she was a guest on TV shows hosted by John Davidson, Dinah Shore, Merv Griffin, Mike Douglas, Glen Campbell, Barbara Mandrell, Ralph Emery, and others. Dottie received a prestigious Clio advertising award for “Country Sunshine,” two CMA Awards, and several BMI Awards for her songwriting. In addition to Jim Reeves, Dottie’s songs have been recorded by Perry Como, Dean Martin, Merle Haggard, Ray Price, The Browns, Skeeter Davis, Tammy Wynette, Lorrie Morgan, and many others. Dottie’s successful career took her though over 25 years of country stardom, through thousands of autographs and photos with fans, and through milestones, triumphs, and tragedies. On the 25th anniversary of Dottie’s accident, Jeannie Seely placed a wooden cross along the Briley Parkway exit ramp in memory of her close friend and mentor. The cross is one of the many Nashville reminders of Dottie’s legacy. Her Bob Mackie outfits are on display in the Country Music Hall of Fame and Museum and in the Willie Nelson & Friends Museum, and she’s represented in an Opry exhibit at the Musicians Hall of Fame and Museum. There’s a mosaic mural of Dottie made from guitar pics at the Famous Saloon which is co-owned by May West, Dottie’s granddaughter. A guitar with Dottie’s name on it sits in a case at Legend’s Corner on Broadway, and there’s a mural honoring Dottie at The Row restaurant located near Music Row. What’s missing, though, is Dottie’s plaque in the Country Music Hall of Fame rotunda. In the 1970s and 1980s, a lot of people accepted country music who didn’t before because of performers who reached out to bigger audiences like Alabama, Dolly Parton, Ronnie Milsap, Barbara Mandrell, Kenny Rogers, Dottie West, the Oak Ridge Boys, Randy Travis, George Strait, and Reba McEntire. With the exception of Dottie, all of those artists are now represented in the Country Music Hall of Fame. Dottie knocked down doors in a “good ole boy” era that wasn’t readily going to let the girls in. Of the 133 current members in the Country Music Hall of Fame, 78% are males, 12% are duos or groups, and 10% are females. The last solo female artist to be inducted into the Hall of Fame was six years ago. Dottie West was one of the most admired, talented, creative, identifiable, original, influential, giving, supportive, and impactful artists and entertainers in country music history. The Country Music Association (CMA) states their mission for the Hall of Fame is to recognize the most significant contributions to the advancement of country music. Hopefully that recognition will include the induction of Dottie West in 2018. 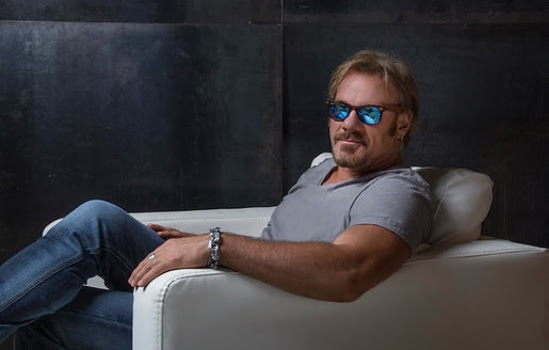 NASHVILLE, Tenn. (December 7, 2017)– Country music hitmaker Phil Vassar will bring holiday cheer to "Fox & Friends" when he performs festive tunes Tuesday, December 12. Vassar will stop by the morning show before he attends the USO's NY Anniversary Armed Forces Gala and Gold Medal Dinner. NASHVILLE, Tenn. (December 6, 2017) - Today the Country Music Hall of Fame® and Museum announced The Judds will be featured in an exhibit opening Aug. 3, 2018. The exhibit will explore the lives and careers of the GRAMMY®-winning mother-daughter duo. 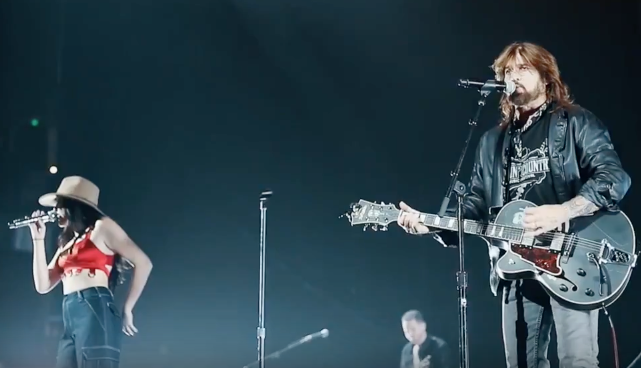 Wynonna and Naomi Judd brought a fresh acoustic sound to country music, with unmistakable harmonies surrounding Wynonna’s powerful lead vocals. The Judds dominated the country charts during the 1980s and ’90s, and have sold more than 20 million albums and registered 20 Top 10 hits. "The Country Music Hall of Fame and Museum is sacred ground regarded with reverence and respect. I am so overjoyed to have the Judds career encapsulated in this new exhibit," Naomi said. “I'm so proud of all the success Wynonna has accomplished and we owe everything to the fans who welcomed the Judds music into their homes." "I am truly humbled and grateful to partner with the Country Music Hall of Fame and Museum to honor the Judds legacy and relive some of the special moments we shared with our fans. What an honor," Wynonna said. 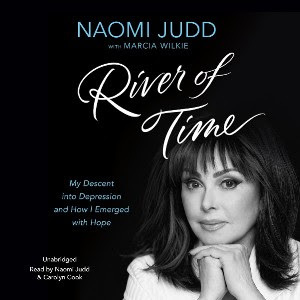 The Grammy-winning country icon, best-selling author and actress will appear on TODAY, Dr. Oz, Access Hollywood, Varney and Co., Huckabee, HARRY, Honky Tonkin' with Tracy Lawrence, SiriusXM's Prime Country and MORE as Judd opens up about "River of Time." Judd will also appear on the Grand Ole Opry as a Guest Announcer December 9 and sign copies of the book prior to the show. “I wrote it with the sincere hope of offering encouragement to the 40 million Americans who suffer from depression and anxiety every minute of every day and night,” Judd said. “I want them to know that I understand, and I’m here to help." For more information, follow Naomi Judd on Facebook and Instagram or visit NaomiJudd.com. 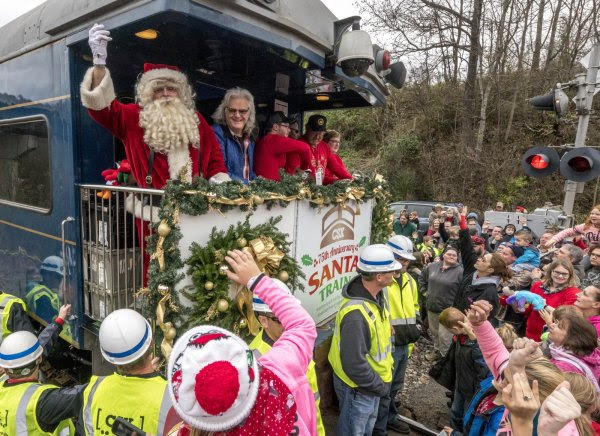 Nashville, Tenn. (November 28, 2017) -- Country and bluegrass legend Ricky Skaggs climbed aboard the 75th running of the CSX Santa Train on Saturday, November 18 for a 110-mile route through Kentucky, Virginia and Tennessee and performed for the crowds in Kingsport. "I didn't know exactly what to expect, I just knew we were gonna be giving away toys, backpacks, clothing and food to the folks in the mountains, but those precious faces I saw gave me more than I gave them. A very moving event," notes Skaggs. "I'd do it again in a heartbeat. CXS was totally professional and prepared. 75 years! Then you have Santa! Awesome! Produced and arranged by Jason Clark, the project features iconic classic compositions with intricate and stunning family harmonies, delivering the musical excellence that Kelly, Jason, Amber and Autumn are known for. 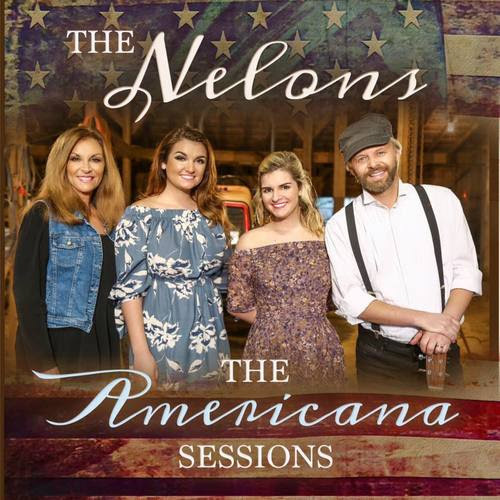 From Glen Campbell's "Gentle On My Mind," to Dolly Parton's "Coat of Many Colors," and "An American Trilogy," to "Bridge Over Troubled Water," The Nelons weave songs of faith, family, God and country in a seamless journey on what could be condisdered a songbook of American culture. Recent Appearances and Performances Include The Talk, HARRY, Rachael Ray Show, Last Call with Carson Daly, Pickler and Ben, TODAY, AOL Build, HLN’s Morning Express and MORE! NASHVILLE, Tenn. (November 21, 2017) – Momentum continues for Billy Ray Cyrus’ new album Set The Record Straight, his 15th Billboard Top 40 Country Album, which includes a new collaboration with Noah Cyrus and U.S. Navy Veteran Derek Jones on “Tulsa Time (Rokman Remix).” CLICK HERE to watch their new “Tulsa Time (Rokman Remix)” video! "I shared the greatest gift I have to give with him - a great song, my daughter and her talent," Cyrus said of his tribute to Don Williams with Jones, who served in Iraq as an MM3 Machinist Third Class Petty Officer . NASHVILLE, Tenn. (November 21, 2017) – Conway Twitty, one of America's most-loved performers of all-time with 55 No. 1 one hits to his credit (second only to George Strait) created a musical legacy that continues to endure and thrive almost a quarter-century after his passing in 1993. 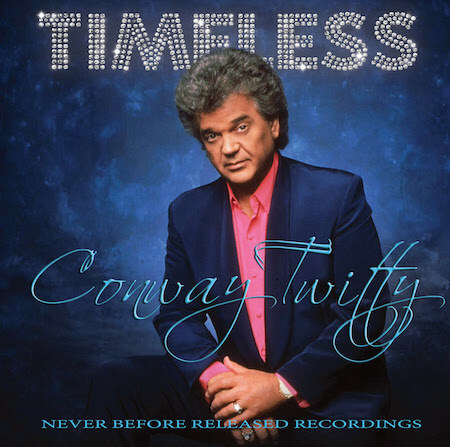 Country Rewind Records has released TIMELESS, a collection of never before heard recordings from Twitty himself. The new record is now available on vinyl and it’s the first vinyl release of Conway music since the 1991 record Even Now. The vinyl is available on ConwayTwitty.com and Amazon. The songs on Timeless haven't been heard since their original airing in 1972, included in a series of musical recordings from top artists at the time as part of a United States recruitment program. Singers such as Dolly Parton, George Jones, and Waylon Jennings would record fifteen-minute performances that would be distributed to over 2,000 radio stations throughout the world intended for commercial release. Tom Gramuglia of Country Rewind Records, says that he can’t wait for fans to hear these recordings - which put the recorded genius of Conway Twitty on full display for all to hear.